This week, Russia’s Deputy Financial Minister, Sergei Storchak said a proposed BRICS bank may take up to 5 years to become a reality. His statements came after the meeting of the group’s financial officials on the sidelines of a G20 meeting in Sydney. This development can be seen both positively as well as negatively. The positive dimensions outweigh negative dimensions and the minister did not argue that the BRICS bank idea needs to be shelved. Conceived during the New Delhi summit in 2012, the bank has perhaps been one of the most crucial subject matter that the group members have been engaged with. This engagement itself, in terms of many rounds of debates and discussions including ministerial discussions, shows the seriousness of the members in continuing the bank idea and giving it a concrete shape. Hence, one can read in the statement of the Russian deputy foreign minister an idea of caution which also reflects pragmatism, devoid of any hasty decisions which may later impact group solidarity. The minister pointed out that there are differences among members particularly on two issues: the percentage of contribution of fund to the bank; and its location. The differences are natural, and there is nothing negative about it. The BRICS bank, when established, will be a major bank not only impacting the global economic system adding another muscle to the group, it will also herald a new economic order away from the order heavily influenced by the Bretton Woods Structures. Hence, the contribution of fund, and particularly the location of the bank is a matter of contestation. But, one must draw solace from the working style of the group. The minister pointed out that any decision about the bank will be taken in a consensus framework. A juxtaposition of the proposed bank with that of the Bretton Woods structure – IMF and World Bank – will be meaningful. The ideas of international financial institutions such as World Bank or International Monetary Fund circulated in the air during the interwar years (the period between two World Wars). Particularly the accentuation of the financial crisis in Europe in the early 1930s motivated then big powers of Europe and the US to think about building international financial institutions to address the financial crisis. It took more than a decade to give those ideas a concrete shape. It was in 1945 that the structures were established. From that perspective, setting up of the BRICS bank within five or seven years may not be a big surprise. The concurrence with multilateral institutions may further extend to the financial problems around the globe though the global economy is more connected now than in the 1940s. 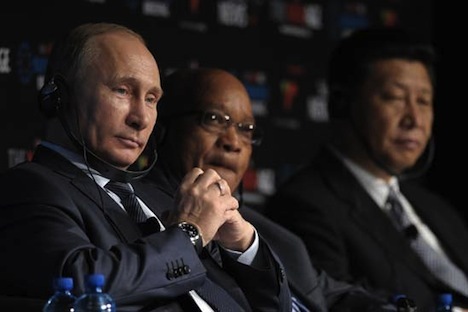 It is on expected lines that the members of the BRICS have to confront the tides of global economic instability and build their economies before embarking on a strong collective financial institution called BRICS bank. This brings to another crucial point raised by the Russian minister. He rightly pointed out that the members of the group have to strengthen their economies before effectively contributing to the bank. He reasoned, “In the first two years we can save national budgets. Plus we bet on the pace of economic growth improving so budgets will be better replenished and we will get a more favourable pattern for countries to be really engaged in the bank’s operation.” This argument makes sense. Over the past few years, the economies of these countries have witnessed a sluggish growth. It is expected that they will recover in coming years. And this growth will help them in participating effectively in the BRICS bank idea and in giving it a concrete shape. It may not be a surprise that by that time the countries may be able to increase the initial funding of the bank. Hence, it will be farfetched to sound a death knell of the BRICS bank. The pessimists may see the idea and its evolution in such a way, but the actual developments do not corroborate such a prognosis. Russia’s Ministry of Foreign Affairs Ambassador-at-large, and also coordinator for the BRICS affairs, Vadim Lukov, recently stated "there is a queue of countries wishing to join the alliance." This shows the rising prowess of the bank and its increasing attraction as an alternate pole. The group needs to decide collectively and evolve a framework to admit new members. The global financial crisis is in a receding mode. The mutual differences within the group members might have cast some negative spells on the BRICS bank idea, but there is nothing so dampening to think about negatively about the bank. Russian minister raised pragmatic issues involving the bank idea. It will naturally depend on the group members whether they stick to rigid policies and mar the prospects of the bank, or they accommodate divergent views and aspirations within the group for the realization of a ‘fair and equitable global order’. While Storchak was articulating the concerns about the bank, Lukov seemed optimistic when he spoke to Russian senators in a session devoted to Russia’s upcoming chairmanship of the group in 2015. "We (members of the group) are like-minded in regards to supporting the principles of international law, the central role of the UN Security Council and the principles of non-use of force in international relations," Lukov said "Russia considers the BRICS as one of the key directions of our foreign policy and at the same time as a generator in shaping the future multipolar world." Russia is assuming the chair of the BRICS in 2015, and one can hope that by the time the summit takes place in Russia the bank idea would have moved forward. The proverb – slow and steady wins the race – may be applicable to the BRICS bank. Now the key is – the members of the groups need to sort out differences.